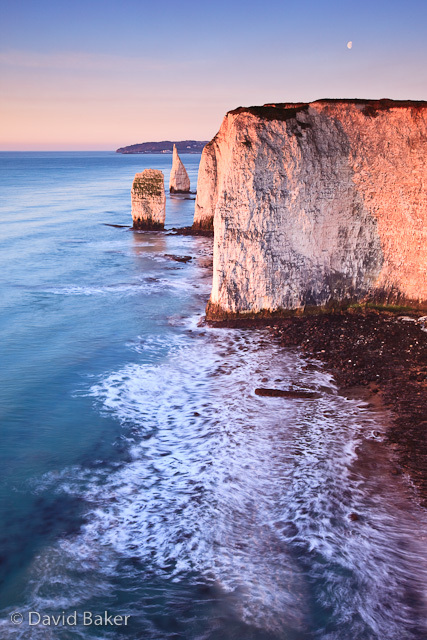 The first rays of the morning sun light up the chalk stacks that form part of the The Pinnacles a series of chalk stacks and cliff face that stand next to Old Harry Rocks, Studland, Dorset. This location is also one of the most iconic along the South West Coastal Path, the path leads walkers to the coastal town of Swanage that can be seen in the distance of this image. ~ by David Baker on 5 March, 2010. Fantastic! I was watching Coast on BBC2 last night which featured the Dorset coastline. I’m getting excited about my trip now. You won’t be disappointed, the scenery is there lets hope mother nature provides some good light and interesting skies.